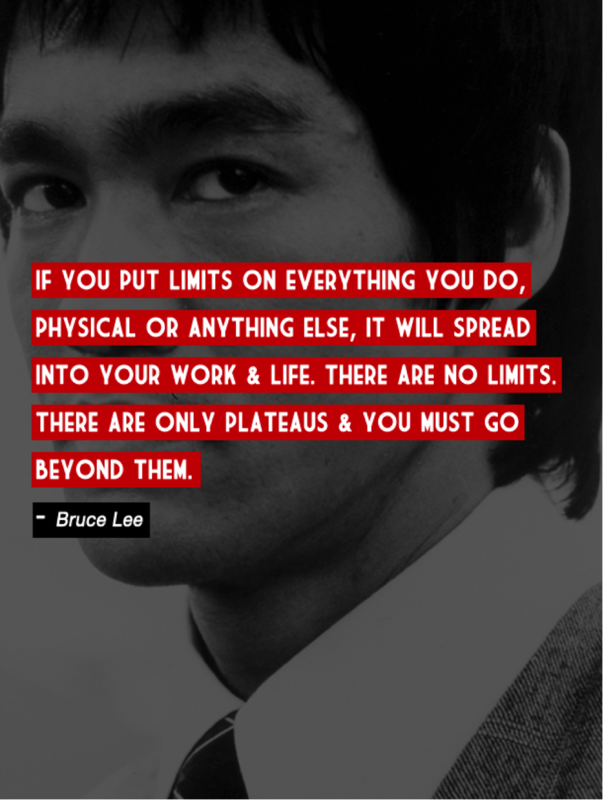 What made Bruce Lee stand apart thus catapulting his status as a great legend of his time? Known and respected for his charm, glorious film achievements, martial arts wizardry and a plethora of dynamic and supremely gifted talents and passions among which poetry and culminating a philosophy of street fighting stand apart, Bruce Lee was a fighter, explorer, spiritual warrior and a dragon who seemed to be on a permanent quest to fathom the spiritual existence of life in the life as we know it. It would be incorrect to hail him singularly for those grand oriental martial arts movies that broke traditional norms and grounds of action film making, garnering world wide acclaim for their blazing fight choreography and high octane action bordering on themes like fighting injustice, hatred, seclusion of the oriental man by the westerners. Here was a man who in the brief 33 years of his life gave as much back to it as he gained from a glorious journey that ended shockingly in 1973, much to the chagrin of those despicable fans, admirers and legion of friends and fellow actors whose lives he had transformed by his fantastic association. It is widely believed that Chinese mafia and an ally of producers and directors, all consumed by the man who lead the resurgence of Eastern Cinema and revival of the Chinese in the USA got Lee in the end. Whatever it was, Lee has not been allowed to rest in peace! How can he possibly rest? He was the only visible benchmark men and young boys measured themselves with, he was a harbinger of hope, a testament of physical perfection, a body constantly in search for the final limit of physical development and obduracy and a mind plummeting with radiance, brightness, philosophy and light. 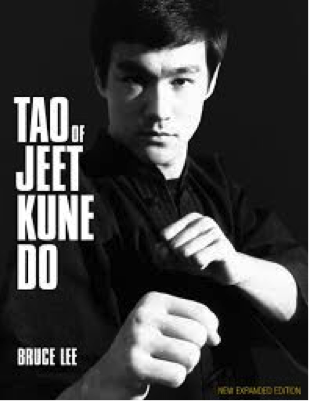 Through his films Bruce Lee didn’t simply depict martial arts as a custodian for ultimate depiction of strength, weaponry of resistance and a symbol of redemption, he made even fellow actors like James Coburn, Roman Polanski, brother Robert Lee and NBA legend Abdul Kareem Jabbar join his tutelage for the great guidance in a rising field in the 60s and 70s. 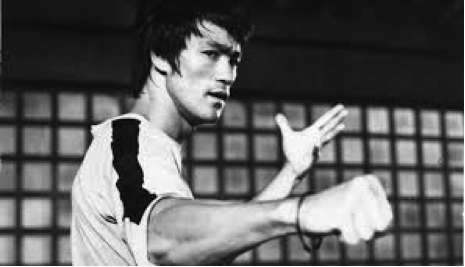 Not much has changed since Lee’s death, save newer forms of fighting and combat art have emerged, but none have been able to strike spiritual chord among fans and practitioners alike the way Lee’s discovery Jeet Kun Do in late sixties did. Called the art of fighting without fighting, Lee in his quest for attaining and developing an ideal platform for countering street violence went there where none ventured before. Striking a harmonious balance between the Ying and Yang, Bruce Lee crafted to perfection a symbol adapting flexibility, pliability, application and self defence through the creation of his signature fighting art Jeet Kun Do. In a highly versatile and respectable career, which Lee bolstered through successfully combining his talents in the art of dancing, ballet, Chinese theatre and martial arts, Lee sculpted a career of epic proportions. Throwing lofty standards to martial art movie making, he entertained and taught audiences the depth in the purpose of self defence and the pride in defending the honour, prestige and respect of the good man or the common man as portrayed in his films who was rescued by gang of thuds and criminal warlords. Lee’s films weren’t just entertaining for their cinematic appeal but realistic in the portrayal of the resurgence of the good man drawn to overpower the evil forces through tacit resistance and sheer physical obduracy. In 1973, the year that marked the release of the great Warner Brother’s production, directed and choreographed by Lee himself, Enter the Dragon captured the pulse of the worldwide audience as the central pivot that captured Bruce’s endearing enigma- the tough man’s fight and the dethroning of the evil that had corrupted the society, all while preserving the sanctity of the hero’s learning, principles and idols. Hailed as the path breaking martial arts film, it is still remembered for Bruce Lee’s merciless martial arts explosion in its full scale of impact, high value drama and for the redemptive powers of self defence. The fight with O’hara where Lee almost killed Bob Wall for his insistence to negate dramatization so as to bring real life fighting grandeur onto screen and the finale where he eliminates the villain in the gallery of mirrors are stuff that dreams are made of. 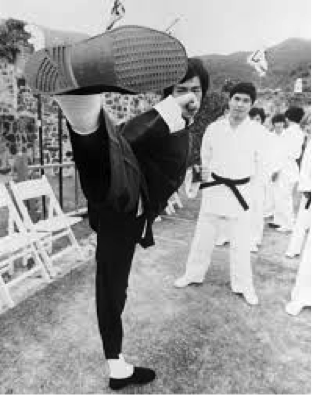 Yet, one cannot simply overcome the visual delight and thrill that Bruce lent his character in Game of Death, where he took on 7.2 feet giant Abdul Kareem Jabbar in a fight sequence that bordered on shear madness, high octane action and heart-stopping martial art extravagance. The man known for creating the one inch punch and a fighting philosophy that borders on realism rather than depending on theatrics was on a constant spiritual quest to develop his mind, body and ultimately, his fighting spirit to perfection. 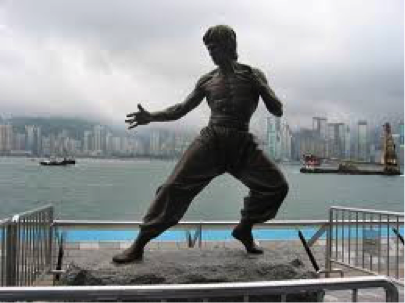 Statues both in United States and in his native Hong Kong from where he rose from oblivion fighting in the streets towards countering his fears toward a making a name in Hollywood, convey Lee’s legend as an eternal battler against fear, that of the opposition and, the mind. The 2.5 meter long bronze artwork of Lee that stands aloft the waterfront at Hong Kong’s Tsim Sha Sui could not have been made at a better location. For Lee’s life conveys the ethos that running water never becomes stale and hence, “my friend you just got to keep on flowing”, the world is convinced of the fact that “in the confrontation between the immovable rock and the flowing water stream, it is the latter that wins, not by strength but by perseverance”. 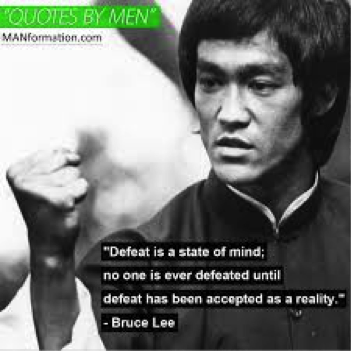 For a life standing on principles of stoic determination, a fire to conquer mental fears and seeking constant improvement, Lee was fluid like water and solid as a Dragon, ever willing to chide away that thing called pessimism and negativity.